In September of 2015, the journey will come full circle with the fourth generation of Gurbaksh Singh ‘Preet Lari’s family currently working on refurbishing old houses in the township from the 1930’s to recreate the vision of their forefather, and to provide a sense of community living. Here the creatively inclined can come, work together and evolve, in the midst of the lush fields of Punjab. The best part about this revival? They’re giving us all a chance to be a part of the story. 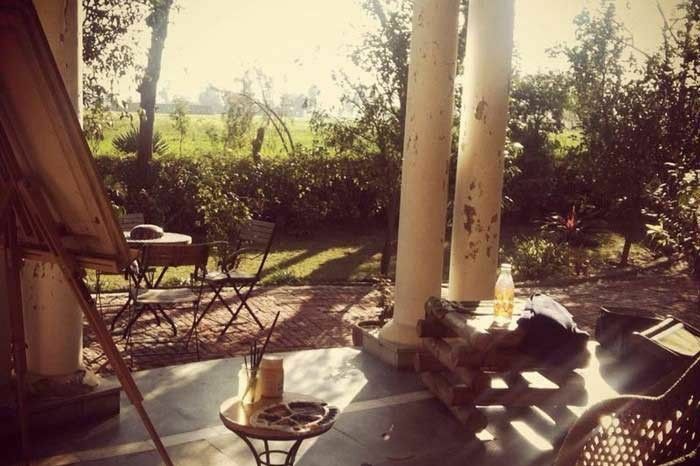 The ‘season time’ for this artist residency offered at Preet Nagar will begin in September and, as summers in Punjab aren’t particularly enjoyable, will wrap up in the beginning of March each year. There will be a few workshops offered in the monsoon season as well, and writers, photographers, musicians and performance artists are all welcome to come and work here, for a nominal pay per day budget that takes care of the food and housing. While it is only workspace that they can offer right now, the team are already in the process of setting up equipment required to host ceramic and printmaking artists as well in the near future. Gurubaksh Singh and team are not only bringing a lost tradition back to life however, they are also involved in the restoration of several old havelis in Preet Nagar from the 1930’s, plus the team is also working on restoring an old Mughal structure that was built during Jehangir’s time for his wife and her aides when they came hunting. This used to be the Preet Lari printing press building, where the magazine was created on the letterpress with wood block and screen print illustrations, which then went on to be published in Punjabi, Urdu and Hindi. The dream is to restore these buildings to their former glory by converting them into airy studios for the writers and artists of today. The first few residencies have already taken place here, earlier this year, when students from Srishti School of Art, Design and Technology worked under Memory Lab, a project lab run by Nicolas Grandi, who was visiting Preet Nagar. Through conversations with people from the township and the neighbouring Lopoke and Amritsar, the students engaged in dialogue about topics such as terrorism, The Green Revolution, the folk art forms of Punjab, and the history of Preet Nagar, while the photographs taken during this session were showcased at an exhibition in Bangalore. In February, the residence saw the patronage of a mix of writers, a musician, performance artists, a photographer and a filmmaker from across the country. Self reliance, as propagated by Thoreau at the time, was at the crux of the visionary’s philosophy and Preet Nagar was Gurbaksh Singh’s own version of Thoreau’s ‘Walden.’ It was this philosophy of self-sufficiency and universal kinship that he propagated through the journal Preet-Lari, written in English as well as Punjabi. It was, in fact, the journal that came first, with the township seeing the light of day about five years later when, living in Lahore in 1936, Gurbaksh Singh found like-minded intellectuals who shared his dream. While looking for space to realise this utopian ideal, the team came across Preet Nagar, which was in antiquity, the Mughal Emperor Jehangir’s aramgah or resort. This is where the Queen Begum Noorjahan would rest during her travels to Kashmir. The ruins of this Mughal resthouse lay forgotten after Jehangir’s death. It was transferred to a manager who died childless, and eventually - hundreds of years later - one of the accountants who worked for the family who owned the property, negotiated a good deal to get Singh the land at one paisa per sq. yard around 1938. 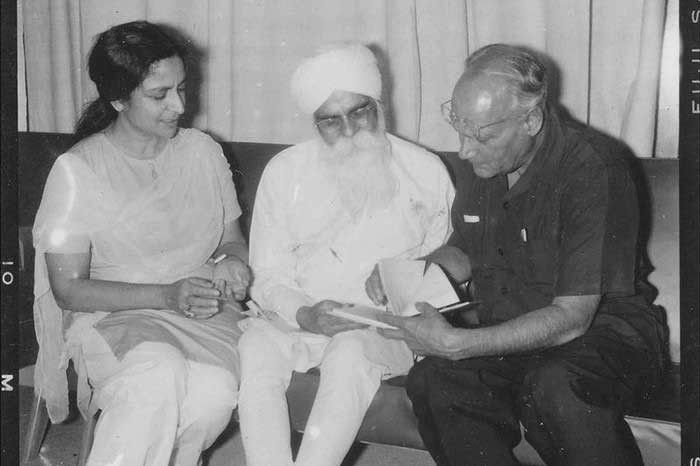 From the Panjab Digital Library: Stalwarts of Punjabi art and literature Amrita Pritam, Gurbaksh Singh Preetlari (centre) and Dr. MS Randhawa. A community kitchen was started, where all the food was cooked together, a motif which became the inspiration for the popular playwright Balwant Gargi’s play ‘Saanjha Chulna.’ The first public toilet too was designed here, back in 1939, which inspired the Sulabh public toilets of today. A co-ed residential school was opened in 1940 sprawled over 8 acres, and this ‘Activity School’ as it was known followed a unique method where children were taught words that he or she already knew in order to learn the alphabet - eventually leading him to master all of them in their rightful context. The flourishing community came to a grinding halt with the Partition though, a casualty to the bloody division of land and lives. On August 15, 1947, Preet Nagar was declared to have become a part of Pakistan in a first announcement, which was followed by a second one on August 25, 1947, which stated that it was to be in India. In the midst of the losses, the strife and communal tensions, the township fell into disrepair, languishing in the memories of the ideologies upon which it was originally formed. Gurbaksh Singh passed away in 1977, and the samadhis of him and his wife can be found in the township, along with those of his son Navtej and grandson Sumeet, who was killed by militants. The Journal Preet Laari, which captured the essence of his ideologies survived and is now published by his grandson, Rati Kant Singh, and edited by Poonam Singh, his granddaughter-in-law. In 2014, a theatre with modern soundproof acoustics, to be used for performances was built here, christened Preet Bhawan. Preet Nagar lives on, a shrine to many who were brought up on the ideology of Preet-Lari, and all who revere it as a cathedral of culture. In keeping with his ideas, it was only befitting that the ashes of Gurbaksh Singh and those of his family who passed away at Preet Nagar, were submerged in the nearby Sakki river, which eventually flows into Pakistan.